If you have or are planning on having multiple people work in your QuickBooks files; in order to protect your private financial information, it’s imperative that you utilize QuickBooks security features that define the user access and permission levels or your employees. As a business owner, if you ever do your bookkeeping manually, you probably don’t allow every employee to see every sales form and account register and payroll stub (or at least, you shouldn’t). If you haven’t already, you most likely have established a system that allows staff user access to work only with information that related to their specific jobs. Even so, there may have been times when, for example, someone pulled the wrong file folder or was sent a report that he or she shouldn’t have seen. 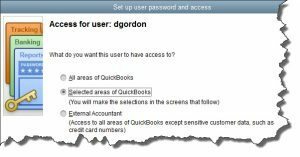 QuickBooks helps prevent this by setting virtual boundaries for user access. 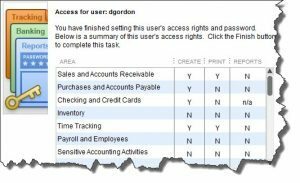 This security feature helps you specify which features of the software can be accessed by which employees depending on who works with your accounting data. 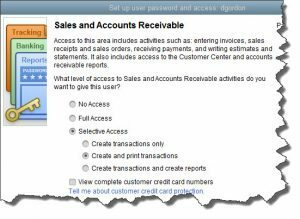 Through QuickBooks, your employees will receive a user access through a unique username and password that unlocks only the areas he or she should be visiting. Note: You can have as many as five people working in your QuickBooks company file at the same time, depending on how many user licenses you’ve purchased. Not sure? Press F2 and look in the upper left corner. If you need more than five user licenses, talk to us about upgrading to QuickBooks Enterprise Solutions. In the next window that opens (see above screen), you’ll be given three options. Probably you’ll most often select the second option, which lets you specify the screens this user can see and what he or she can do there. The first—All areas of QuickBooks—would seldom be granted. And the third allows us to come in and do whatever tasks have been outlined in our work relationship (troubleshooting, monitoring, creating and analyzing reports, etc.). If you’re feeling any uncertainty or confusion about the whole issue of access rights, we’ll be happy to go over your options with you. These are important decisions, ones that not only protect your business but you and your employees. QuickBooks provides these tools to protect everyone who uses the software as well as any external individuals and companies that might be affected. If you have any questions regarding this security feature or any other feature of QuickBooks, our experienced team is here for you. Contact us and any one of our knowledgeable associates is available to help answer any questions you may have.